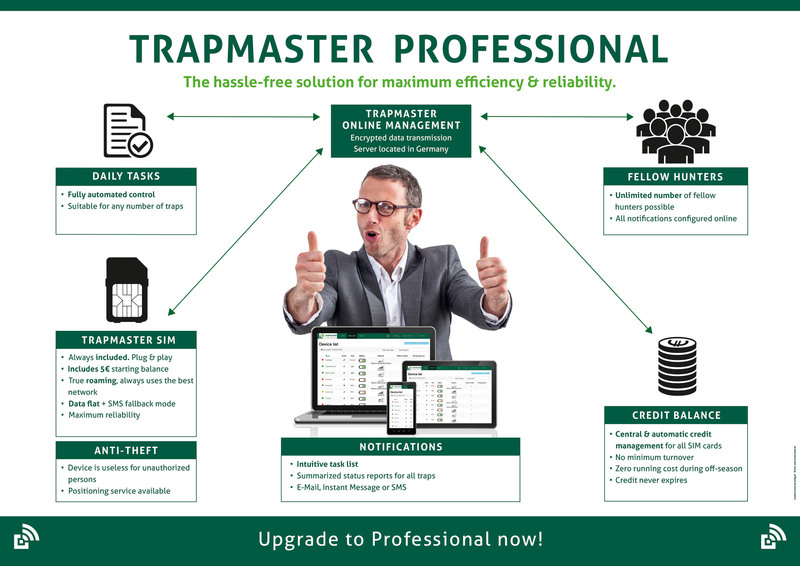 Online trap management with TRAPMASTER Professional - TRAPMASTER trap alert / trap alarm / monitoring system - the ideal retrofit for most trap types. Experience the simplest operation and superior reliability with TRAPMASTER Professional, the complete system. Just hunt! - That's the basic motto behind the extensive Professional solution. With groundbreaking innovations, the Professional device sets new standards in reliability and usability of trap alert systems. It has been rigorously designed with the goal of ensuring optimum reliability and efficiency in all trap hunting applications. All components in the system are carefully matched and thoroughly tested. You benefit from a number of advantages that you will not find in any other trap alert system in this form.